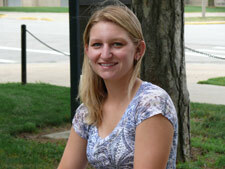 Molly Knoblett is a senior in the Department of Kinesiology and Community Health. I love the small class size. Your professor and teaching assistant get to know you on a more personal level. They have an open door policy. What has been your best/most interesting/most beneficial experience at the U of I? I-LEAP (the College of Applied Health Sciences’ academic enrichment and leadership program) has been the most beneficial experience during my college career. I have been given the opportunity to do and experience things that I never saw myself do as a freshman. It has really helped me to develop into a better student and person. I’m a member of and have held offices in the Kinesiology Student Association, Chi Alpha Epsilon, and the AHS Service Committee, and I'm a member of Orange Krush. I plan to attend graduate school to pursue a doctorate in physical therapy, eventually hoping to work in pediatrics. In my spare time, I enjoy staying active playing sports, photography, and cheering on the Illini! Why would you recommend the College of Applied Health Sciences and KCH to others? I'd recommend the College of Applied Health Sciences to anyone wanting to get into the medical field because it provides a well-rounded preparation.